Do you like the basketball I am hiding under my shirt?! Total weight gain: 23 lbs. as of my appointment on Wednesday. And I believe it... I do feel like I have gained more. Maternity clothes? 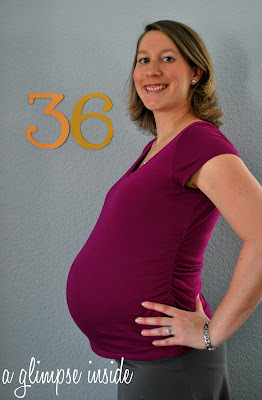 Yep, I've pretty much been wearing all maternity clothes but I do have some regular tops that I can still fit in. Best moment this week: Getting to speak with Travis on the phone again. And then hearing Baby M's heart beat at my check up and knowing she is head down and ready to go! Looking forward to: My parents will be arriving this week! :) My mom is bringing the bedding she sewed for the nursery so I can't wait to see it in there! Oh you are just too cute. You look beautiful, positively glowing! I am glad that you are feeling pretty good and that Baby M is doing well and in the right position for arrival ;-) Take good care and please post photos of the baby's bedding when Mom and Dad arrive!! Enjoy the few weeks you have left, it's such a wonderful time filled with excitement and anticipation!